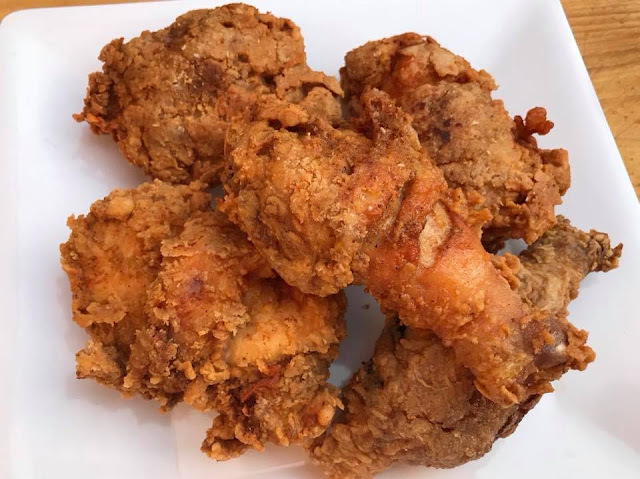 Fried Chicken is one of my kids favorite. This chicken recipe is not only but also easy to make and full of flavor. The chicken is marinated overnight with spices, coated and deep fried until crispy. Give it a tray and let me know. Hope you like it. Rinse, drain and cut chicken into bite size. Set aside. Using a large Ziploc bag or a deep container combine flour, 5-spice powder, garlic, ginger, salt and ground pepper. Add chicken to the above marinade mix. Mix to coat all the chicken and cover container. Refrigerate for at least 2 hours . Place egg in a bowl with the 1/2 cup of water. Beat together with a fork. Set aside. Combine 1/2 cup cornstarch and 1 cup flour in a bowl. Set aside. Heat deep frying pan in medium heat and add cooking oil. Dip the chicken first in the watery egg mixture then in the flour and cornstarch mixture. Deep fry chicken in batches for 4-5 minutes or until golden brown and fully cooked. Try not to overcrowd the pan so the chicken will cook evenly. Place fried chicken on a wire rack or a plate lined with paper towels to drain excess cooking oil. Serve hot with sweet and sour sauce or any dipping sauce prefer on the side. Enjoy.